The project is part of the international educational, social and political cooperation with workers’ representatives, trade unions and companies in the European Union. Arbeit und Leben e.V. 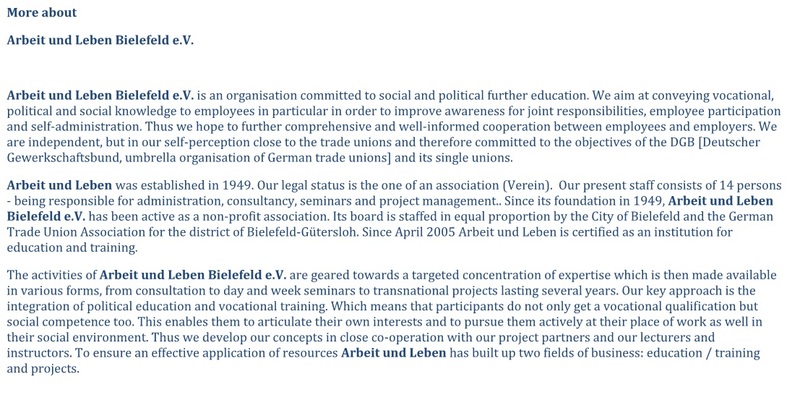 Bielefeld is an organisation committed to social and professional further education. We aim at conveying vocational, political and social knowledge to employees in particular in order to improve awareness for joint responsibilities, employee participation and self-administration. Thus we hope to further comprehensive and well-informed cooperation between employees and employers. We are independent, but in our self-perception close to the trade unions and therefore committed to the objectives of the DGB (Deutscher Gewerkschaftsbund, umbrella organisation of German trade unions) and its single unions.